NASA will reveal new discoveries about the violent fate of our Milky Way galaxy today (May 31), the space agency has announced. NASA will hold a press conference at 1 p.m. EDT (1700 GMT) Thursday at the agency's headquarters in Washington, D.C. Scientists will discuss new Hubble Space Telescope findings about the inevitable crash of the Milky Way and Andromeda galaxies, which will occur billions of years from now. 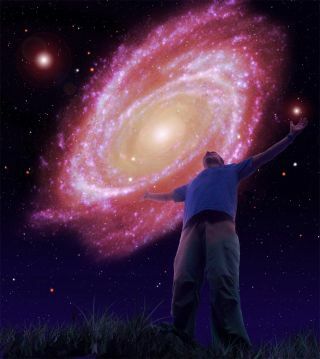 "Because of uncertainties in Andromeda's motion, it has not been possible to determine whether the Milky Way will have a head-on collision or glancing blow with the neighboring galaxy billions of years in the future," NASA officials said in a media alert Friday (May 25). "Hubble's precise observations will settle this question." The Hubble Space Telescope, a joint effort between NASA and the European Space Agency, launched in April 1990 aboard the space shuttle Discovery. In the 22 years since, Hubble has revolutionized the way humanity views the cosmos.